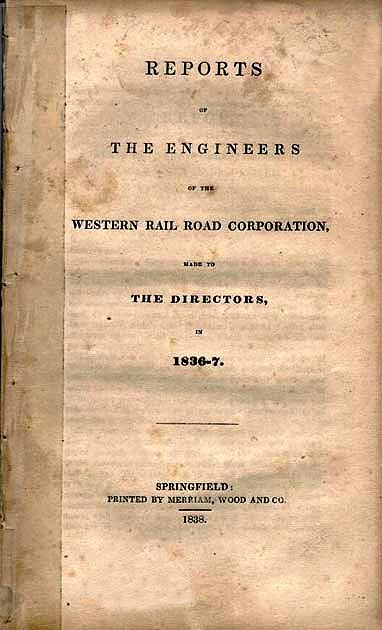 REPORTS OF THE ENGINEERS of the WESTERN RAIL ROAD CORPORATION made to THE DIRECTORS in 1836-7 as printed in Springfield, Massachusetts, by Merriam, Wood And Co. 1838. ... When the Western Rail Road was chartered, the idea of steam locomotives climbing hills was so absurd that the promoters had to imply to the Massachusetts Legislature that they intended to build an "ordinary" railroad using animal power and stationary steam boilers for the inclined planes. "The waters of the Blackstone, upon which the village of Worcester is situated, are separated from those of the Chickopee, by a tract of country, elevated from 450 to 650 feet above the level of the Boston and Worcester Rail-Road at Worcester; ... "
Deciding which route was preferable was a most difficult task and the engineers presented 15 different options including an inclined plane. 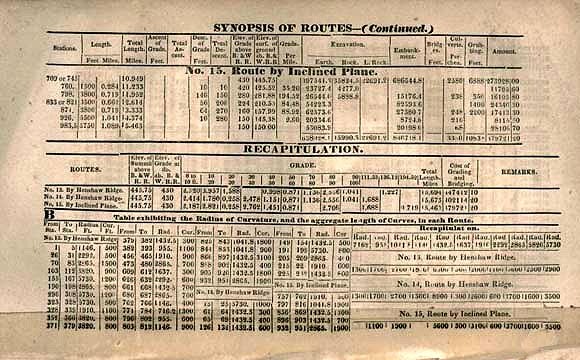 A followup report on the same, dated Sept. 30th, 1836, recommends the route via Morey summit and that is the route you'll ride today on Amtrak's Lake Shore Limited. This is a technical report, but designed to be understood by the directors. Calculations are that a locomotive that can draw 260 tons on the level, could draw 46.60 tons on a grade of 80 feet to the mile. The engineers also discuss the difficulty of valve settings on grades which is just as much a challenge in China in 2005 as it was in Massachusetts in 1836. Both reports are signed by William Gibbs McNeill and George Washington Whistler as Engineers, and W.H. Swift as the Resident Engineer. A wonderful study ... in the early history of Worcester, Rochdale, Charlton, Spencer and Brookfield ... in the foundations of railway civil and mechanical engineering. These reports witness the conception of the world's first mountain railway. 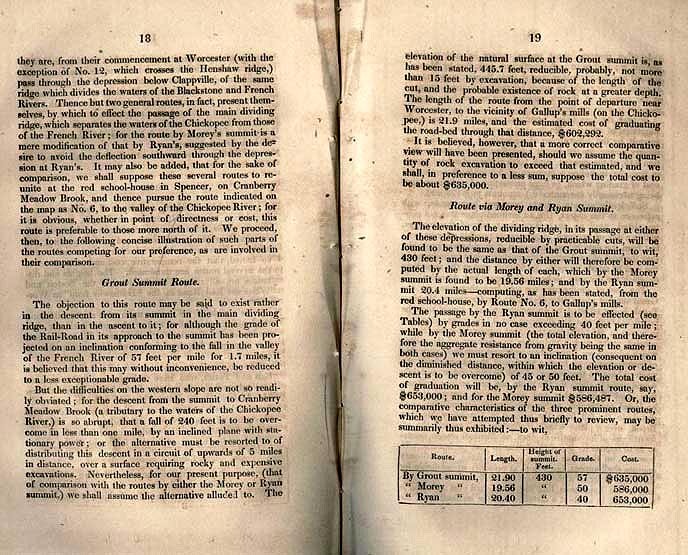 See cover and pages 18-19 and 38. Question: Information on Railroad workers?